Good-day everyone! So besides loving beauty products, I'm a totally food junkie and Caribbean girl at heart. I am in no way a food expert or fabulous cook but it does take time and experimenting with recipes and ingredients to create master pieces. I am therefore starting a new series cooking my way through local cookbooks to see what I can come up with. Today's recipe is a simple one where I'm recreating from the famous Naparima Girls' High School Cookbook which has been a staple of cookbooks in my kitchen. 2. Remove skin from ham and score fat in diamond shape and stick with cloves. 3. Combine sugar, mustard and fruit juice and spread over ham. 4. 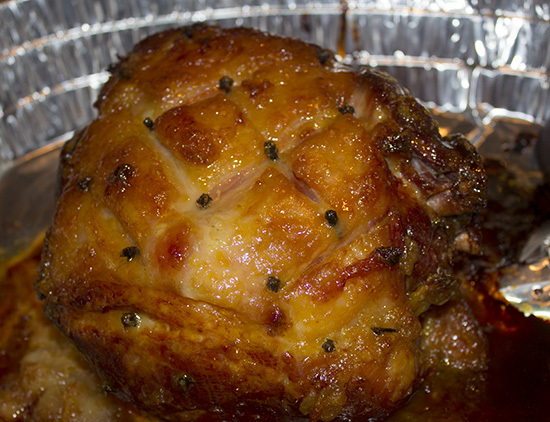 Return ham to oven and continue to bake for 20-30 minutes, basting occasionally with glaze. The cookbook itself didn't have a picture for the final product, so here is my step by step guide for each of the instructions listed above as well as some additional pictures to better understand the process. Starting from the top left hard corner; moving to right, then second row; also moving to the right, then third and forth row ending with final product in final picture. 1. Shows my ham of choice: Blue Ribbon pork picnic ham, 7 lbs. 4. Ingredients for the mustard glaze. I'm using Swiss prepared mustard, brown sugar, Nestle Orchard orange drink and Chief whole cloves. 6. Ham cooked and ready for glazing. 7. Ham stripped of skin, scored into diamond pattern and stuck with cloves. 8. Ham with glaze on and in oven about 20 minutes. So I basically followed the recipe exactly as the book stated and the results were great. 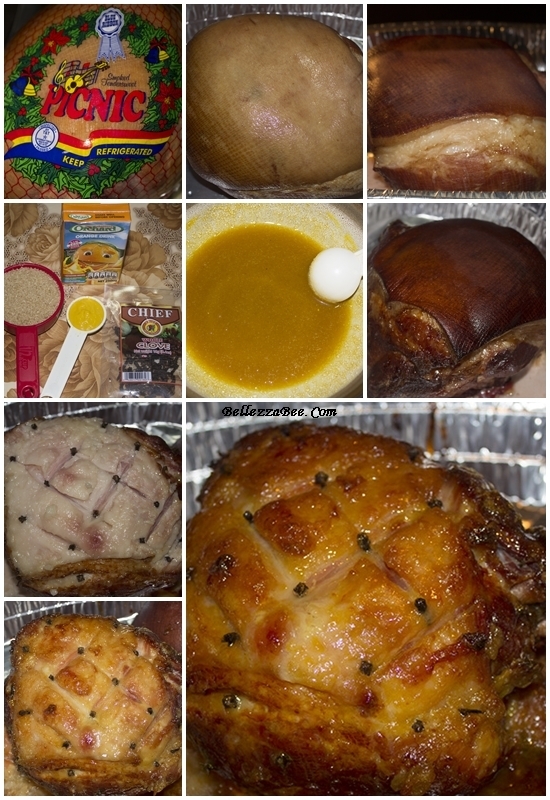 The ham was cooked but still moist. Some additional steps taken included removing some (not all) of the fat under the skin and cooking just a tad bit longer to ensure the sugar glaze gave a brown caramel colour. Enjoy with hops bread, some simple dressing, lettuce and tomato.